John Michael Shelton will discuss poems from his book "The Dragon in the Tree House" today at 11:30 a.m. at the Starkville Public Library. 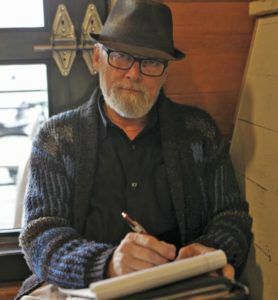 John Michael Shelton will discuss poems from his book "The Dragon in the Tree House" today at the Starkville Public Library at 11:30 a.m.
Shelton was named the 2018 Mississippi Poet of the Year and the Mississippi Poetry Society published "The Dragon in the Tree House,” which is a collection of at least 100 poems. According to the author, his apartment resembles a treehouse and he had a cane with a dragon head on it, so Shelton was the literal dragon in the tree house. The birth of his son, Ryan, was the beginning of his career as a poet. He was a single parent when his son was eight months old and wrote a poem about him. "It was storming one night and I heard him moving around and I sat down and wrote a poem," he said. "That was my first one." Since the birth of his son, he also has a daughter, Salina, and eight grandchildren. He was proud of his first poem and continued to write more. One evening, Shelton was sitting at his mother's house and she said "If you're not going to do anything with that stuff stop doing it." He gathered several of his poems and had them typed up for submission to Mississippi State University. His efforts earned him the Eugene Butler Scholarship in Creative Writing. "I will not forget what Price Caldwell told me at the time. He said 'Yours was the best of some really bad entries this year,'" Shelton laughed and said. Caldwell made Shelton promise that he would do something with poetry in his lifetime with the scholarship he was awarded. Shelton completed his degree and emphasized poetry during his 22 years as a literature teacher to high school students. The Mantee native also became president of the Mississippi Poetry Society. "I worked really hard to keep my promise to Dr. Caldwell that I would do something with my scholarship," he said. Shelton said you give him a topic and he can write a poem about it. In the past he's written poems about politics, anniversaries, funerals, birthdays and more. The Friends of the Library are hosting the Book and Authors event in celebration of National Poetry Month. Past president and member of the Friends of the Library Board Sue Minchew said Shelton's poems are relatable and easy to understand. "At the same time convey a depth of emotion not unlike Robert Frost and Emily Dickinson," she said. Shelton said his greatest accomplishment is when his students tell him they never liked poetry until taking his class. Many of them use their poetic abilities in music. "I think having them fall in love with it as much as I did was really the crowning achievement," he said.